Hurricane Sandy is currently pummeling the East Cost of the United States, causing millions of dollars in damage and over 300,000 power outages as of Monday afternoon. Sandy will likely cause many more families to go without power before she runs out of steam. In the hours preceding such a potentially devastating storm, there are many things to think of. Flood-proofing the house, keeping track of family and pets, making sure you’ll have enough supplies to last through the worst of the store, to name a few obvious concerns. Food safety in emergency situations is one of those things that’s easy to forget about until that unexpected or unthinkable thing happens. In cases where people might be stranded without power for an extended period of time, it’s especially important to know what to do with your food. We rely so completely on our appliances that we forget what important food storage tools they are. Being familiar with food expiration dates and the other rules of perishable foods is a great basic knowledge to have in emergencies. We’ve gathered up a couple of recipes for foods, like Granola Bars, that are good to have on hand in a power outage as well as some tips for everyone who might be affected by the hurricane fallout. Dried foods are easy to store, keep for a long time, and have a higher concentration of nutrients (since all the water has been sucked out). 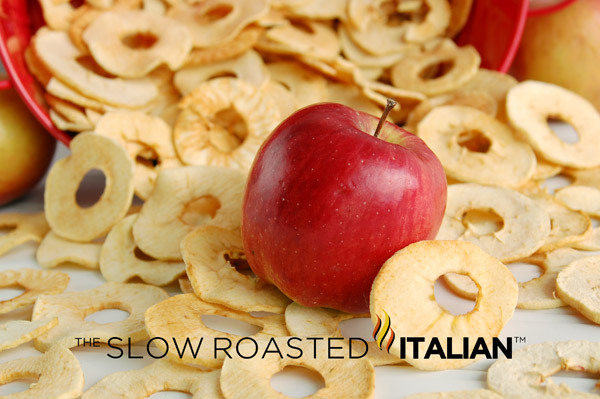 Donna and Chad from The Slow Roasted Italian have some excellent recipes for Apple Chips and Banana Coins that include instructions on how to make dried fruit in your own oven. Since dried fruits have a higher concentration of sugar, be careful how you ration these out to your family. Krissy and Danial from The Food Addicts have a great tutorial on how to make your own Beef Jerky at home, and they include recipes for five different flavors. RecipeLion.com and FaveGlutenFreeRecipes.com have a variety of granola based recipes that would be great emergency rations in a power outage. If a storm is headed your way, making non-perishable foods ahead of time is an excellent way to make sure you won’t be caught unawares by whatever the weather might throw at you. If it looks like you might be without power for an extended period of time, make sure you have a cooler. Even an inexpensive Styrofoam cooler will do the trick. If possible, equip your freezer and fridge with appliance thermometers. Procure a digital thermometer, if you don’t already have one. You’ll want to be able to measure the internal temperature of your food items, as well as your appliances. Have a decent amount of non-perishable foods, preferably foods that you don’t have to heat up or cool down. Canned foods are perfect for power outages–just be sure you also have a can opener. Purchase a large ice block to help keep your freezer cold for longer if you think you might experience an extended power outage. Prepare your freezer and fridge by making a list of everything in them and where the item is, so you don’t waste cold air rummaging. Do not open the refrigerator or freezer. 40*F is the magical number for perishable foods (milk, dairy, eggs, leftovers, and meat). Once these foods have been at 40* or above for over two hours, they are bad. An unopened fridge can keep foods at below 40* F for up to four hours. A half-full freezer can maintain below 40* for 24 hours, and a full freezer can last up to 48 hours. Eat canned and pre-cooked meals for as long as possible. Jerky, granola, and dried fruits are good foods to have on hand in this type of situation. Check the temperature of your freezer and refrigerator, if you have an appliance thermometer. If it is above 40*F, discard any perishable items. If you do not have an appliance thermometer, check the temperature of each individual food item with your digital thermometer. Examine food on an item-by-item basis. Discard food if it has an unusual odor, color, texture, or feels warm to the touch. This handy chart has information about individual groups of food. Never taste food to determine its safety. If in doubt, throw it out. Do you have any food safety tips for power outages?